When you think barbecue, Pulled Pork automatically comes to mind. 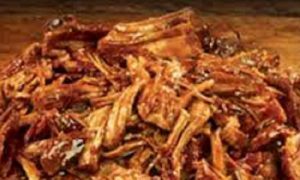 The classic American method of low and slow makes this delectable treat well worth the time and patience you need for this dish to turn out just right. Jumbo’s Original and Jalapeno Sloppy Joe Sauce will help you take your pulled pork to the next level! One pork shoulder – approximately 8 lbs. Wood chips – We recommend a sweeter wood like hickory, oak, maple or apple if you plan to use our Original Sloppy Joe Sauce. If you want a spicier Pulled Pork, Jumbo’s Jalapeno Sloppy Joe Sauce pairs very well with mesquite. Pulled Pork is a labor of love. A day before you plan to cook your pork shoulder, give it a generous rub. We like to keep it simple, with a 50/50 blend of salt and pepper, but you are welcome to use your favorite rub in place of this. Put on a pair of surgical gloves. You’ll want to massage your rub into every contour of your cut of meat. Cover with foil, and return for 12 to 24 hours to your refrigerator. The day of cooking, pull your shoulder back out of the fridge, and let it sit at room temperature for at least 30 minutes while you prep your oven, grill or smoker. In a roasting pan, place a rack to prevent your shoulder from sitting in the very bottom of the pan. Add 1/2 cup of water to the pan. Optional, add 1/2 tsp of liquid smoke of your preferred flavor to the pan. In a mixing bowl, place 1-2 cups of wood chips with an equal amount of warm water. Let sit for at least 30 minutes as you are warming up your cooking device. Place 1/2 of your chips in a foil packet. Poke the packet with a fork to allow for ventilation. Place over the heat source on the grill. Place your soaked wood chips into the smoking pan of your device. Bring your Oven, Grill or Smoker to 225 degrees Fahrenheit. Place your meat into your cooking device, and allow to roast, uncovered, for 3-4 hours. After this time, pull your shoulder out from cooking to wrap in foil. This will allow you to keep moisture in for the remainder of the cook. Place the other half of wood chips into your grill or smoker, and return the shoulder to your cooking device. Allow to cook another 6-8 hours. At 10 hours, use a meat thermometer to test the internal temperature of your shoulder. It should be at 190 degrees Fahrenheit before you pull off of your heat source. If you have reached this magical temp, pull your meat off to let rest for 30 minutes. If not, crack open your favorite beverage, return the meat to its heat source, and relax! After your meat has rested, place it in a container for pulling. We suggest a disposable foil pan. Grab the shoulder blade bone, and gently pull. It should come out cleanly with little to no effort. The next step depends on whether you like doing things cleanly, or if you like getting your hands dirty. For those cleaner folks out there, grab a couple of forks, and start to gently pull apart your roast. If you’re like us, pull on a pair of surgical gloves, and go to town! Once your meat is pulled apart, it’s time to sauce. Open up your container of Jumbo’s and pour in until the mixture of meat and sauce is to you and your family’s liking. If there’s any sauce left, put it in the refrigerator. There are a lot of other ideas on our website for you to use the rest!